Teacher’s Comments: Don’t bother. There are a lot of better courses in Washtenaw County. This is a favorite course of a friend of mine, but I can’t for the life of me figure out why. There are plenty of better courses and better bargains in Washtenaw County and southeastern Michigan. I am sure that designer William Newcomb is not putting this track on his resume. For me, the holes swung between bizarre and uninspiring. Despite the fact that I played well, I just didn’t think the course was a much fun. The first hole (photo top) is a good example of the bizarre. From the teebox, the fairway slopes downward at a 45 degree angle. At that angle, even a short to moderate hitter like me can reach the bottom. But you don’t want to be at the bottom, because there is a creek surrounded by a swath of swampy area that you can’t see from the tee. Even if you know that the creek is there, you really don’t have any idea about the extent of the soggy ground that surrounds it. That’s annoying enough, but from the bottom of the hill, you are faced with a green that rests on the top of a ninety foot high plateau. Thus, I hit a good drive and was “rewarded” with having to make a high wedge shot out of swampy ground. I got splattered with mud. I suppose that, with local knowledge, I would have hit a shorter tee shot, leaving the ball well short of the swamp. But then, I would be faced with a downhill lie on a longer, lower shot that is likely to slam into the side of the ungroomed hill, or skip across the back of the green. The eighteenth (second photo from top, on right) also is strange. 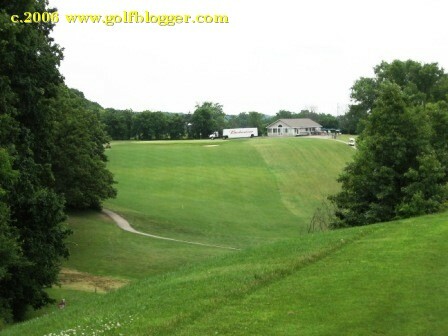 You begin with a tee shot off one highest tee boxes I have seen in southeastern Michigan. With a good blast, your shot will fly over the deep cut and slam right into the equally steep hill on the opposite side. The green, of course, is at the top of that hill. And it’s guarded by hidden bunkers. So a good tee shot is rewarded with a difficult uphill lie. You could, of course, lay up to the bottom of the hill. But the bottomland is swampy, and you then would have a blind 180+ yard shot out of a bog up a steep hill at a green guarded by bunkers. On several holes, I just absolutely had no idea what I was supposed to do. What appeared to be the line of attack turned out to be the worst possible decision. On others, the strategy was obvious, but there were hidden “gotchas.” My least favorites were the surprise ditch at the top of the hill on seven and the hidden swamp in the second shot landing zone on fifteen. You need a lot of local knowledge to have fun on this course. If you’re playing for the first time, my recommendation is to abandon all idea of playing quickly and scout out the potential landing zones on every shot. Course conditions on the day I visited were terrible. 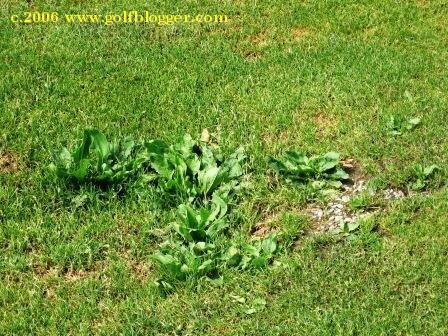 The tee boxes were ok, but the fairways were patchy—lots of dry spots, grassless areas and weeds. 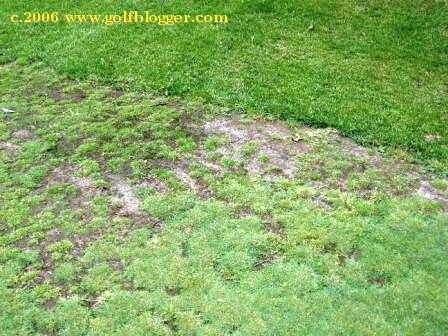 What was inexcusable, however, was the condition of the greens. They were by far the worst I’ve seen this summer. My recommendation is to skip this course. 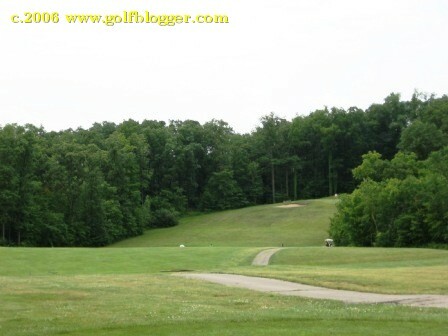 The Hickory Sticks Golf Course review was first published July 13, 2006.